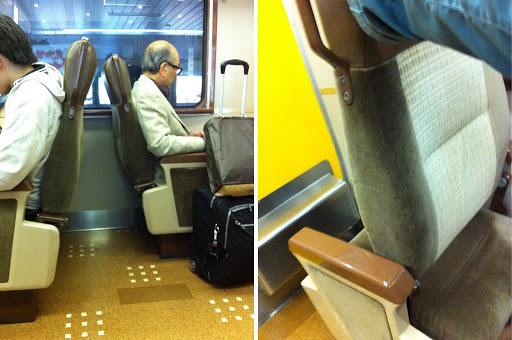 I had thought the Shinkansen seats were cool. They had the power sockets, the cybonic up-right chair backs and the leg room needed to satisfy a wookie with no knees. By the time I reached downtown Sapporo, I realised they were nothing more than second-rate, yesteryear designs in the same category as tape recorders and ball point pens. It was true that the train that dragged itself up to the platform at New Chitose Airport did not look like it had the capacity to rock my world. It appeared as the standard rattly locomotive that did the subway rounds. Motion in general did not seem to be a strong priority, either in getting to our final destination of showing up at the airport in the first place. I stepped on board behind an elderly man who was using his wheeled suitcase as a cane. We entered one of the back carriages to see the seats all facing the rear of the train. I was unfazed by this. My childhood Hornby model railway set had taught me that locomotives can clip equally onto the back and front of trains, so it was inevitable that sometimes the seats would be reversed. It was perhaps a little unfortunate, since I found that travelling with my back to the engine occasionally made me travel sick. However, since all the seats in this carriage faced the same way, I could probably vomit over the person in front of me and be off the train before they could truly kick up a fuss. The old man was having none of it. He released one hand from his suitcase and grabbed the handle on the side of one of the seats. With a squeaking of hinges, the back of the chair slid over the seat cushion to clunk down on the opposite side. The man then sat and looked expectantly out of the window towards the direction we were headed. I took a quick look around the carriage and then gingerly stood up and pulled on my own seat handle. With an identical thump, the seat direction also reversed, accidentally crushing my carry-on as it did. I sat down hastily. Shortly after this discovery, a group of school kids climbed on board. They proceeded to redesign the rest of the carriage, making some seats face each other and others stand in rows. It was possibly a complex reflection of their social network or more probably the result of each boy feeling the urge to move a least one chair before sitting down. Rather like the desire to use the bathroom as soon as an exam starts, it only now occurred to me that I really wanted to take a photo of a chair half-way through its repositioning. There was the perfect single seat right in front of me but it contained a small girl. A line of thought suggested that this wasn't really a barrier to me suddenly moving it. Fortunately for all, the girl exited the train at the next station and, as we started to move again, I leaned forward and pushed on the seat handle, snapping a photo as the chair back moved. Behind me, the gaggle of boys went briefly quiet. I did not turn around. Travel on a UK train, kids, and you'll be composing Haiku to these by the time you return.